I never got to meet John Brown, the Welsh chairmaker, artist, writer and author of “The Anarchist Woodworker” column in Good Woodworking magazine. But he is with me in the shop every day. I saw one of his Welsh stick chairs in Good Woodworking in the 1990s, and it changed me in an instant. I knew that the chairs he’d dug up from the rustic countryside and dragged into the modern shop were exactly the type of chair I wanted to build. Yes, I like Windsor and ladderback chairs. 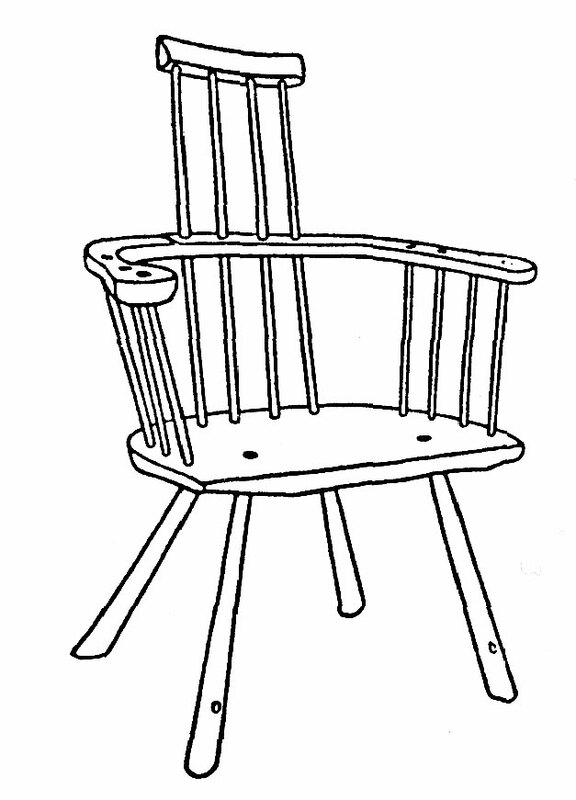 But Welsh stick chairs, which look more primitive and animal-like, are far more interesting to build. I wanted to take a class with Brown, but I missed out on his short visits to the United States. And going to the United Kingdom in the 1990s to learn to build chairs was just a crazy idea with my salary and my young family. 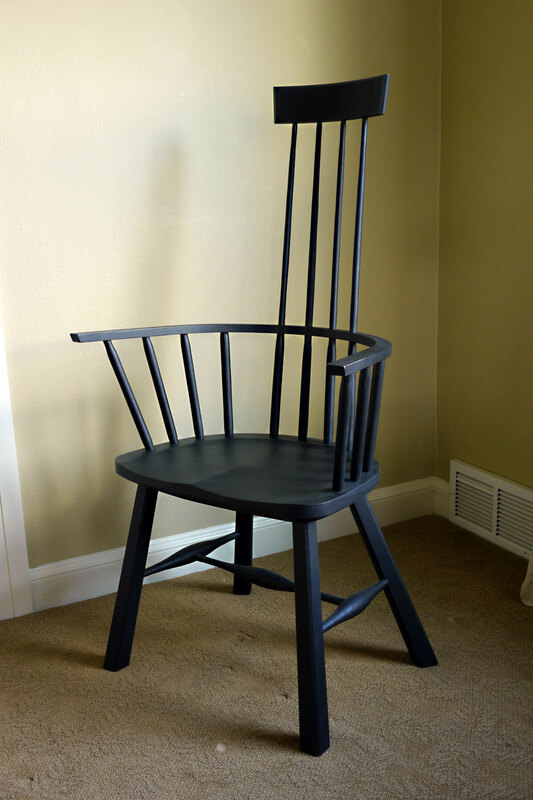 So I sought out closer chairmakers to learn about Welsh chairs, which took me to Cobden, Ontario, and Paint Lick, Ky. Yet it has always been Brown’s chairs that I have been studying and striving for. 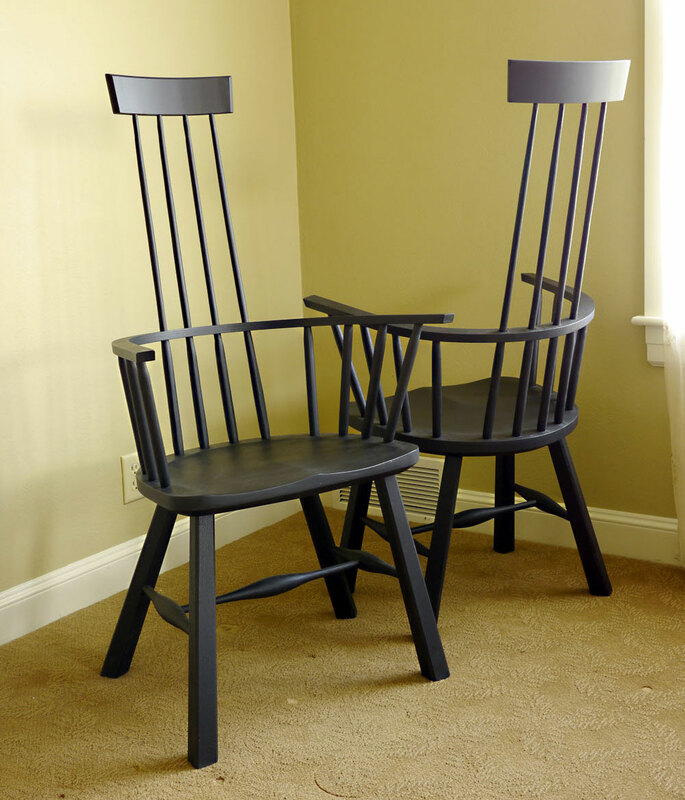 This fall I finished two chairs that are influenced by chairmaker Don Weber (I love the rake and splay of his legs), by Brown (the four-spindle back is classic Brown), and a little Schwarz. I lightened the arm bow, altered the seat plan and designed the crest rail from scratch. When I sat down these chairs for the first time, I wanted to smoke a cigarette – and I don’t smoke. But Brown did (check out his book “Welsh Stick Chairs” for some great photos of this). So I might be getting close. Thanks John Brown, wherever you are. This entry was posted in Gallery of Work, Personal Favorites. Bookmark the permalink. That is one cooool looking chair Mr. Schwarz! Nicely done! Yes, I know you made two, so the other one looks cool too. I love the way the legs come out of the floor. Yes Chris, the splay on the legs is excellent, gives the chair a certain rootedness! John Brown is a champion of hard-won, hand-built furniture pieces. His article in an older issue of FWW is one of the reasons I became so interested in hand tool work. Great, now I want a smoke too. And I also don’t smoke. Nice work! Great work. What wood did you use? Really like the splay of the rear legs. Each section of the chair complements the next yet stands alone with it’s shape and function. Watch out Chris, next you will be getting a load of request for a Welsh stick cair making class!!!!! this is a beautiful piece of furniture. The first stick chair I’ve seen, i would like to have in my living room. I like the reduced modern looking style. Only the stretchers between the legs won’t fit completly to that design in my unworthy opinion. Very nice chairs,though I suspect John Brown would not approve of the turned stretchers! I notice that John’s work and philosophies figure greatly with you,and wonder how much of your Anarchist’s tool chest was influenced by some of the articles that appeared in John’s columns in the UK’s Good Woodworking magazine? If they were then all to the better,he pioneered a return to hand tool woodworking ,at least on this side of the pond. A more fitting muse you could not have had! Indeed. Mr. Brown did not suffer turners lightly and often got in trouble with them. Brown is my hero. I wish I had his bluster. You and I have been on similar journeys and have visited the same shops, but unfortunately never at the same time. Keep doing what you are doing because it is making a difference. Has anyone been able to convince Mr Brown’s descendants to allow the printing of a compendium of his Anarchist Woodworker articles? Yeah,John was one of my heroes too,allthough we lived in the same country[Wales] I never met the man much to my regret. It is a shame that there is so little of his works and philosophies available in the written world. I have some of the Good Woodworking articles written by him but not all and i too would love to see these published along with other articles he wrote. How about it,Chris,could you do this? Here’s hoping. A John Brown retrospective is the hands of others. I have offered to help. Truthfully, I had to force myself to not read Brown’s columns (one of my prized possessions) during the last couple years so that “The Anarchist’s Tool Chest” didn’t sounds like I was channeling Chairman Brown via a Ouija Board. But making these chairs this fall brought a lot of things flooding back. It’s time to revisit them. Black paint over green paint. Please please please teach a class on this chair. Somewhere in the southeast! Those are beautiful. Thanks, but I’m not really a competent chair-maker. I’d take a class with Peter Galbert, Dave Sawyer, Curtis Buchanan, Elia Bizzarri, Mike Dunbar or one of the other people who live and breathe rake, splay and tapered conical tenons. I need to build about 50 more chairs before I think I could teach it. The tall, straight back reminds me of Charles Rennie Macintosh. Is it comfortable to sit in? I think they are quite comfortable. The prototype is my dining chair that I sit in every night. I will second Peddler’s critique of the stretchers being the only pieces that seem a bit out of place. Perhaps a milder bulge would allow them to slip into the more modern lines of this chair. Other than that I love the chair, and that is coming from someone who has decidedly modern tastes. I also agree that the tall back has a bit of a CRM feel. But can you build them in a weekend? If this is your first stop on the line headed out of birdhouse station, I think it’s going to be an interesting ride. That looks like some fine craftsmanship on some of the ugliest chairs I’ve ever seen. Woof! I am a big Brown fan too, I also like your chairs, the paint gives them a more modern feel than John’s chairs and I like that though painted wood does not sell in the UK. I am less sure about the legs and stretchers than the top half. I am one for shaved stretchers too and I think the legs could thin down some “add lightness and simplify”. Great splay though. If we ever made the perfect piece the journey would end and we could give up. Hmmm. Not my cup of tea, but I could not discourage anyone who likes them. …And they look fun to make. I did a course with David Fleming, a few years ago and it was great( I heard he doesn’t do courses anymore!)! realy like the style and the comfort of the arm stick chairs! Yours look great!! Fleming is immensely talented. And one of the nicest guys ever. I enjoyed the class I took with him years ago. Wish we was still teaching.